Age: 16 (GS), 18 (GSD), 20 GSMovie Birthday: October 29 Blood type: O Genetic type: Coordinator Height: 170 cm (GS), 174 cm (GSD) 178cm GSmovie Mobile suit: GAT-X303 Aegis Gundam ZGMF-1000/M ZAKU Warrior ZGMF-X23S Saviour Gundam ZGMF-2000 GOUF Ignited ZGMF-X09A Justice Gundam ZGMF-X19A Infinite Justice Gundam Gundam SEED A member of the elite Le Creuset team which attacks Heliopolis, Athrun subsequently becomes the pilot of the captured Aegis Gundam. 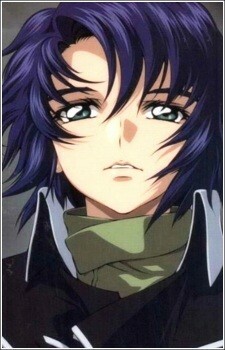 As a child, Athrun attended a preparatory school on the moon, where he became good friends with Kira Yamato. Now, with his father leading the most warlike faction of the PLANT Supreme Council and his mother among the casualties of the "Bloody Valentine" tragedy, Athrun is determined to defeat the treacherous Earth Alliance - and shocked to discover that Kira is fighting on the side of the enemy. Athrun has a talent for mechanical tinkering, and has created numerous robot pets for his friends and acquaintances. Gundam SEED Destiny The famous Athrun Zala took up residence in Orb after the end of the previous war, taking on the alias Alex Dino and assisting Cagalli as her aide and bodyguard. When he accompanies Cagalli to Armory One for a meeting with Chairman Durandal, Athrun is drawn into the new conflict, and with the fall of Junius Seven and the outbreak of full-scale war he decides to cast aside his false identity and return to the battlefield. On the field of battle, Athrun Zala excels piloting just about anything. When he pilots a standard mobile suit ZAKU warrior (Phase 1), he is able to pilot it with immense skill and bravery. Noted for his skills, Durandal provides Athrun with Saviour, one of the new Gundams. He is extremely agile and fast and makes use of power, speed, and skill all at the same time. However, despite his improved skills, he cannot easily defeat enemy Gundam pilots such as the experimental Earth Alliance pilots. With that being said, although his skills in combat have a definite increase, they are not as skilled as that of Kira Yamato. After his Saviour is destroyed in battle with Freedom, Athrun gets the Infinite Justice and fights alongside Kira's Strike Freedom.